The excitement of getting to know the Mother has worn off. Now this final season of How I Met Your Mother feels like a slow crawl. We knew going in that spending 20-plus episodes on a single weekend would result in a few slow-paced episodes, but I figured the first one wouldn’t be so soon in the season. 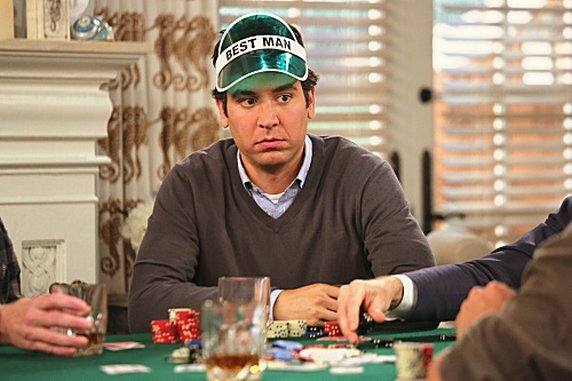 “The Broken Code” revolves around Barney revealing that he saw Ted holding Robin’s hand as he comforted her at the carousel (last season) and feels his best man broke the Bro Code. It’s an obvious plot point that needed to unfold to get the friends to move past this bump in the road. At first Barney doesn’t seem upset with the revelation, but throughout the remainder of the episode he proceeds to give Ted insane tasks like moving to the basement of the hotel and being the caretaker of a dozen or so doves. It was obvious he wasn’t happy with Ted, and it’s made apparent when he takes away Ted’s title of best man and gives it to The Karate Kid foe William Zabka, returning from his guest appearance last season. Ted is adamant that his holding hands with Robin meant nothing and after a few debates in front of Marshpillow 2.0 (more on that in a second), Barney forgives him. Just like that. No repercussions or anything with any gravity whatsoever. Speaking of Marshpillow 2.0, that’s just Lily’s way to have Marshall—who is stuck in the worst subplot of all time on a roadtrip across the country—around with the gang. It’s a body pillow with an iPad taped to the head with Marshall FaceTiming with the group. It really adds nothing to the plot, but I have to comment on it. Did Jason Segel, who was the last one to sign a contract for the final season, only agree to sign on if he only filmed for a day each week? Why else stick such a great comedic actor in such a terrible plotline? I can’t stand it and can’t wait for Marshall to get back with the group. The final storyline was about Lily’s disdain that Robin had no other girlfriends. This would have been a great opportunity to introduce Robin to the Mother, if only for a brief second. There was a scene when Robin was shooting down potential girlfriends, and she could have made a negative joke about the Mother and moved on. Maybe that isn’t the best possible solution, but it was better than how it was represented. All in all this episode was just there with nothing too special popping off the screen. In short, this was very forgettable with some cute moments that didn’t add up to much.